Investing: The Collected Works of Martin L. Liebowitz. First edition of this collection of essays by Leibowitz. Thick octavo, original cloth. Inscribed by the author on the front free endpaper in the year of publication, “To Keith Anderson, With all best wishes, Marty Leibowitz February 18, 1991.” Fine in a very good dust jacket. Foreword by William F. Sharpe. Edited by Frank J. Fabozzi. Martin Leibowitz, Director of the Research Department at Salomon Brothers, was the first "house mathematician" in a U. S. bond firm. Leibowitz's analytic approach brought an important new dimension to Salomon's research effort. The work and writings of Leibowitz and his associates over the years have played an important role in advancing modern portfolio theory and practices. 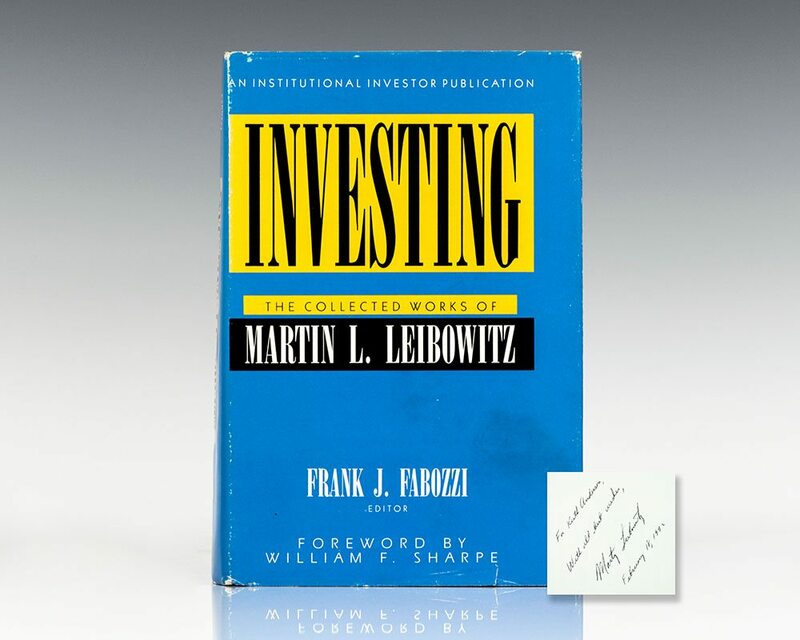 Investing: The Collected Works of Martin L. Leibowitz, a compilation of Leibowitz's groundbreaking work, is divided into three major parts: asset allocation and pension fund strategies; analysis of returns for stocks, real estate and convertibles; and framework for bond portfolio management.